The KK 370 screw compactor is the largest machine for compacting EPS and is recommended for an annual volume of more than 50 tonnes. The screw compactor can compact the EPS at a ratio of up to 50:1. The density of the compacted blocks is approx. 350 kg/m³. The compacted blocks can be stacked on a pallet and sold for recycling. A truck or container can load approx. 20 tonnes. The EPS is pre-crushed in the hopper and the screw and the automatic hydraulic jaws compact the EPS to solid and uniform blocks. The density and size of the EPS is crucial for the choice of pre-crusher. The machine can be fed manually into a 45° hopper or by conveyor belt into a vertical hopper. The different incorperated sensors ensures easy operation with the automatic start and stop function and adjustable speed. 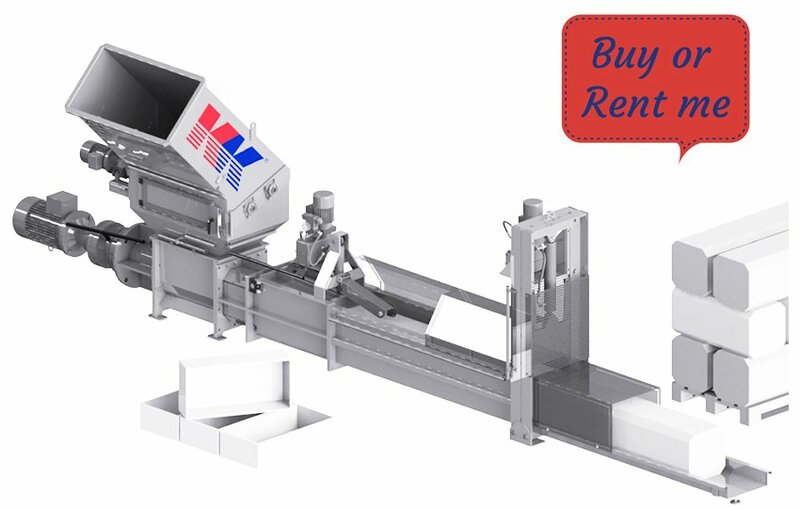 Twin models with two or three screw compactors ensure high efficency. It is also possible to place the compactor below a silo and buy automatic block divider and crane for handling the compacted blocks. Generate income from compacted EPS blocks. Pre-crusher is available in different configurations and motor sizes. Twin models with multiple screw compactors. Automatic block divider and crane for handling the compacted blocks.